The man behind many contemporary projects, including the atmospheric, wonderfully ethereal MURICIDAE and the glittering, eccentric, fully extravagant dark electronica of SILVER GHOST SHIMMER, does not rest before introducing his brand new concept into the amazing catalogue of most capable productions. Having pretty much been a living-in part of furniture in London’s Blackwing Studios for nearly a decade, he was instrumental during the most prominent years of synthpop. Co-engineering acts spanning from DEPECHE MODE, FAD GADGET, DEAD CAN DANCE, CLAN OF XYMOX to COCTEAU TWINS, Fryer was also responsible for the biggest album by NINE INCH NAILS, ‘Pretty Hate Machine’. With such wealth of experience and impeccable musical eloquence, Fryer, now living and working in Oslo, calls himself a producer of “old, new and future”, a man liking to be full-on, having his “hands dirty in the music”. His latest project BLACK NEEDLE NOISE takes its name from the sound made by a stylus on vinyl record, and is described by the master himself as “music for the movies you haven’t dreamt of yet”. ‘Before The Tears Came’ describes the emotion embodied in tears of joy or sadness while experiencing the opus, where “each song should have its own life, its own story. Take you on a strange and interesting journey”. This newest audio alchemy by Fryer is “its own movie”, which is performed by different vocalists, to suit a particular mood, to paint a different soundscape. 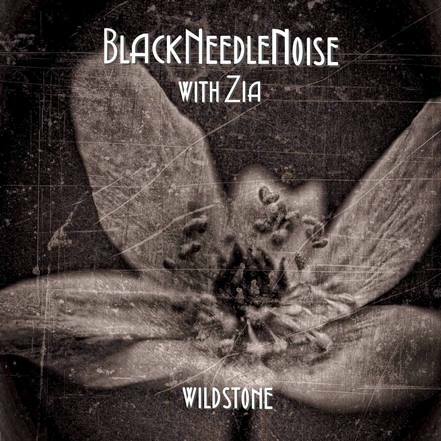 The journey starts with the gritty sound of ‘Wild Stone’ with freshly sounding vocals by Zia, plus impeccable bass and surprising addition of trumpets. You’re taken by hand, “all the way” into the core of the production via ‘Vexation’ featuring Jarboe; a mantra about the “syndrome of blaming other people instead of taking personal responsibility for your own actions”. Ledfoot is the chosen voice for ‘3 Steps Backwards’. The creator of the genre of Gothic Blues performs this avant grade track with his signature vocal and musical uniqueness, before Andreas Elveness takes to the stage with ‘Mourning Morning’. The track, easily could have been a lost Bowie piece, with the dark aura of electronic connotations, while Antic Clay (duly recommended to Fryer by Jarboe) lends his help on ‘Queen Of Dust’. 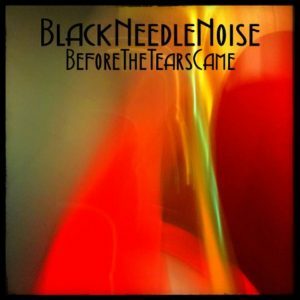 Here’s where BLACK NEEDLE NOISE is taken to Americana Noir, with the Tarantino inspired track filled with fuzzy guitars and pronounced bass. Jarboe returns on ‘Human’, which, true to her manifesto, “closes the gap in the audience / performer relationship” by enticing singing style, which almost draws one in deeper, with the excellently landscaped production. 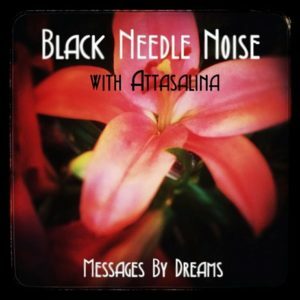 Attasalina, whom Fryer met in Ojai, California via Daniel Ash of BAUHAUS, performs on ‘Messages By Dreams’. A scarce addition of sharp guitar riffs glides around electricity laden synth, punctuating the acute feeling of this creation. Meanwhile Elena Alice Fossi is ‘Behind The 4th Door’, waiting to seduce with her MADONNA-like vocal. Described as “extra-terrestrial pop irradiations”, this uptempo track makes you want to open the 5th door to discover ‘Dead Star’ with Betsy Martin in charge of the microphone. A bride to SILVER GHOST SHIMMER’s bass player Kevin Kipnis, the lady knows how to use her unusual vocal. 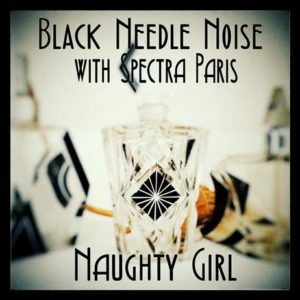 Spectra Paris, aka Elena Alice Fossi, again excels on the most alluring track on the opus, ‘Naughty Girl’, before the master himself under a pseudonym of Dr Strangefryer closes the production with ‘I Face The Wall’. Fryer previously lent his voice to the first ever song BLACK NEEDLE NOISE produced, ‘Bang, Bang’, and here he wraps up the collection with a gyrating rhythm of filthy synth, shaping his sonic sculptures with musical knowhow and production wizardry. Although the concept of a collection of tunes performed by various vocalists has been frequented before, with the notable example of Alan Wilder’s RECOIL project, Fryer explores miscellaneous artists and finds the collaborations “interesting, as (he) likes to watch them bring something different to the music”. Each song hits from different angle, tells a different story and evokes different emotions. All those, laced with a masterful dose of Fryer’s production, which is second to none, amount to a truly eclectic collection of grown up, arty Grindtronica overtones, which takes the listener to a level of pleasure never experienced before. John Fryer has done it again, but who could doubt that he wouldn’t?